It’s All Saints’ Day and All Souls’ Day in a few days and I thought I’d write about my mom and dad. One of the last conversations I had with my mother before she had a stroke and went into a coma was an interesting and totally memorable one. It was an early April afternoon. I was visiting her at her home and she was so happy to see me and was in good humor. She was in a light, playful mood, as if she seemed to take life less and less seriously as she got older. She was far from what she was when I was in high school – the tough momma who was so concerned about building my character. She had clearly mellowed and was now quite relaxed and even fun. After the usual small talk, I remember talking to her about what it would be like if we could suspend the mode of relating that had defined us both as mother and child. After all, I was already in my late 40s and she was in her 70s. I was telling her that I no longer wanted our relationship to be constrained by the biological roles that fate had assigned to us – she as my mother and I as her son. We had, to my mind, outgrown that. I wanted to know her and for her to know me just as another human being. In other words, no longer should I think of being a dutiful son who must please his mother, and I suggested that it would be good for us to just enjoy each other as human beings that afternoon without the history that bonded us. She quickly understood. We sat for an hour telling stories as we usually do but with a difference. I was looking at her beautiful face that showed the lines of wisdom that two marriages, 10 children and an extremely interesting life had lovingly etched on it. I saw a human being who was beyond being my mother. I saw a human being who was in the afternoon of life, and I remember how her disposition suggested to me an afternoon that was building up to a beautiful sunset. I knew she was looking at me, also, with fresh eyes. For the first time, she even showed open delight at the green jokes I was narrating in place of the admonishing that I would usually get before. It was such a great golden moment that afternoon as we just enjoyed our first conscious “human to human” contact without the straightjacket that familial bonds can sometimes impose. I then asked her a host of theoretical, speculative questions: Considering that familial bonds are earthly ties, what would she be to me, and vice versa, in heaven where these bonds have ceased? What happens to biological relationships when we are all spirits later on? How would we ever find each other in heaven? At the last question, she smiled and said that we surely would find each other since love will always find love. I smiled and hugged her. I was so grateful I had that moment with my mother. I felt we were able to experience a breakthrough as “real” people. It was good to have a moment with her in this way before she went into a coma a few weeks later. That afternoon is one of the most beautiful memories I will treasure of her. Dad and I when we turned 42. I do not have too many memories of my father. He died in a plane crash when I was six. I have more memories of how people saw him, admired and even loved him. He seemed to be a swell guy. 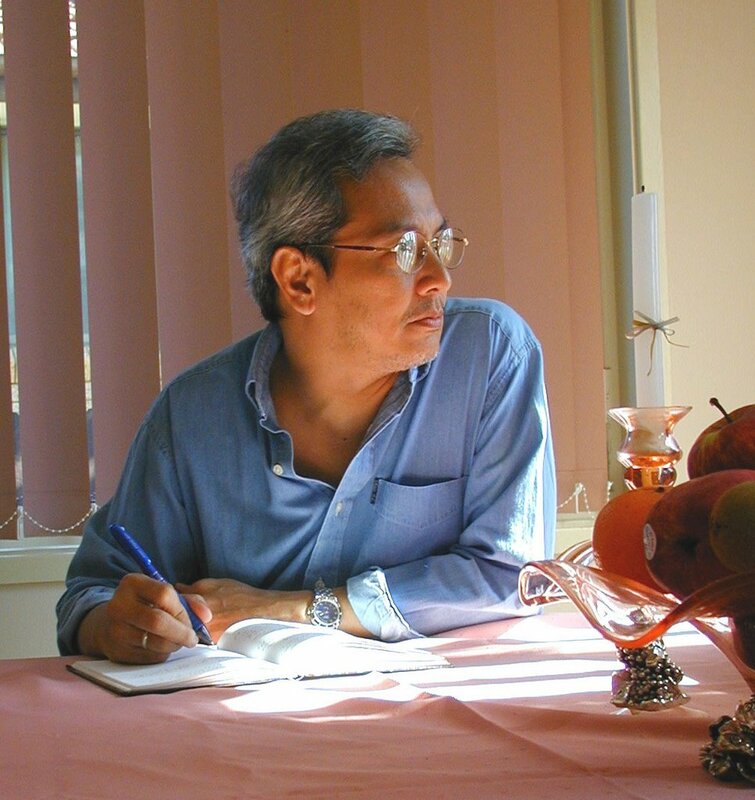 He was not just a husband, father, a golden boy and dutiful son to my grandparents, but was also a teacher, a media person and an intellectual. My elder brothers and sisters were lucky to have known him firsthand. I only knew of him. I remember attending a PTA meeting in school two years after my dad died and found myself feeling different – actually quite ashamed that, unlike my classmates, I had no father with me. Many times in my teenage years, I actually used his being “absent” from my life as leverage when I wanted something. In my childishness, I would pray to him and make him feel guilty and then ask him for some wish to be granted. Strangely enough, I got a lot of what I asked for. Growing up, I had a “father hunger” that was hard to fulfill. I would feel this longing at different times in my life but could not identify it. It was only after attending a workshop called Reparenting the Child Within (RCW) with Sister Harriet, a kind and strong nun who mentioned the term, that it fully resonated with me. Many times growing up and even as an adult, I really missed having a real, live biological dad. And yet, I did feel his presence many times in my life when I would meet old students of his, or old friends who would talk about him to me. In many situations when I was in some sort of moral dilemma, I would actually ask myself what dad would do. I’m glad I knew enough about him to guide me. He seemed like a really great guy and from what I can reconstruct of him, based on what I know so far, we would probably enjoy each other’s company a lot – the way my son Mio and I get along. During the early days of APO’s career, I would often dream of my dad, and strangely enough, that would signal that I was about to go on a trip somewhere. In my dream, he would be emerging from a plane crash site, dusting off his white suit and walking with me as we talked. He was young, handsome and quite animated. It felt so real and the glow of the experience lingered with me the whole day. The dreaming stopped a few years ago. At first I was wondering why. Could he have moved on to another plane and felt no need to take care of loved ones on this earthly plane? I don’t know and will never know for sure. I am speculating that he probably felt I did not need any more “fathering” at my age, knowing how much I now enjoy the role with my own kids and students. Ever since I started writing for the Philippine Star, I’ve been getting a lot of letters on my once not too active email address at yahoo. They write to react to something I said in the column that resonated with them. There are some who express disagreement. Even though some of them read the article on my website, they opt to email rather than use the comment box. I suppose some people are not comfortable having others read their thoughts and reactions on my blog. Whatever you readers choose is fine with me . As Mae West liked to say, ‘Call me anything but call me often.’ ha ha. I also noticed that since then, I’ve also stopped writing regular stuff on my blog. By that I mean writing in a more informal mode. I normally write ‘on the fly’ and just correct the grammar and spelling after and upload it immediately. But since I got the column, I’ve been more deliberate. Well, this entry is going to change that. I just want to write without having the pressure of being deep or profound and scrutinized by readers of the Star. This is my blog and I shall do what I please. So if I sound stupid in this entry, well… this is ME right now. 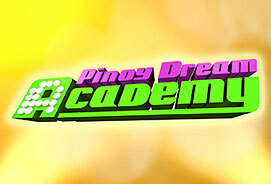 Ever since I took the job of headmaster for Pinoy Dream Acadremy, the reality TV show of ABS-CBN, it seems I have assumed a different persona to a lot of people. While I am still recognized as Jim of APO, I am also called “headmaster’ now and after they ask me a question or two about Danny and Boboy, they ask me also about their favorite scholars in PDA. It seems that in many people’s eyes, I have been recreated. And even if PDA is just a TV show, I feel that having the title of ‘headmaster’ seems to have imbued me with some respectability and even ‘authority’. This is the power of media. Don’t get me wrong, I do take the job quite seriously. I am dealing with young artists of various backgrounds, temperaments and levels of talent. Together with Moy Ortiz, Maribeth BIchara and a few others, our job as their teachers and mentors is to teach them as much as we can to give the wings to fly later on. In practical terms, we want them to be better singers, dancers and people and we are aiming to recreate them to better versions of themselves that is more or less measurable every week. It’s not an easy job for them and us. We all work hard and often we see the results. But they have a long way to go, and so do we. Personally, I enjoy seeing their stories unfold, not so much the love angles and the bickering which reality TV picks up, but the personal triumphs that they experience. Some of them never imagined that they could ever summon the talents they have inside, or the spirit to pick themselves up after disappontments and redeem themselves over and over again before the TV audience’s eyes and most importanty before their own. Crisis helps people individuate once they get over the feeling that it will break them. Or maybe it really does break them and what comes out is the beautiful essence inside. If you haven’t seen an episode, try catching it around 9:30 PM every night. You may not get into it with just one watching so watch two or three episodes. A good story is bound to unfold. I’ve been getting many nights of bad sleep since I returned from Sydney. All of a sudden, I find everything in my old neighborhood too noisy. There are the tricycles, the noisy diesel cars that pass by, carpenters who hammer quite eartly in the morning, the dogs barking. All these wake me up too early too often. Five months in Sydney made me rediscover the beauty and healing powers of good sleep and silence which I now sorely miss. 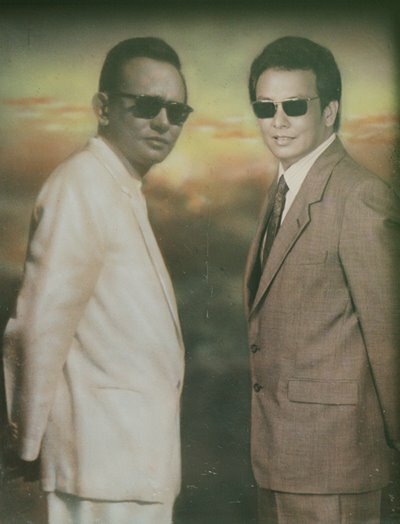 Kami nAPO Muna, the tribute album to APO continues to rock! It’s great that since its relrease last August, it is still selling very briskly. It is still no.1 in the record bars, and the songs are still top downloads for ringtones, and yes, also enjoying heavy radio play. The craziest thing is that Danny, Boboy and I are once again receiving mail from grade school and high school students. It was quite a thrill (and a laugh) recently hearing a grade 6 student over the radio request an APO song in the original and new version. To many of these kids, they are discovering us for the first time. I’ve heard of many parents and kids buy the double album and exchange listening tastes. This is so pleasantly unexpected and wonderful. It’s good to be recognized for something we did in the past. Time was when we started, Danny, Boboy and I were looked at as ‘hip’. As we got older, we became ‘respectable’. Now, we are once again hip and respectable. Ha ha. As I always tell my own kids, you never know what life will bring! Make sure no one’s home! Michael Jordan refers to it as a moment when the basketball hoops seem like they are three times bigger. Singers, musicians and dancers sometimes describe it as being one with the song, music or movement during performance. Hobbyists of all kinds and types, when totally in the moment, seem to be lost in joy as time passes by with nary a notice. I am talking about ‘flow’, or what artists and athletes refer to as ‘the zone’. This happens when we are totally present and absorbed with what we are doing—whatever it is—and even if we are not artists or top athletes. It could be as simple as crocheting, or playing golf for people my age and older. I know people who get high while baking, or getting a massage, or running and exercising. Scuba divers, even when time is a crucial element they must be aware of and constantly monitor and calculate, can get lost in timeless wonder at the beauty and mystery of the ocean floor. I get high on music, and some of the songs I’ve written I made while in ‘the zone’. I remember when I sat down and wrote ‘Batang-bata ka pa’, I felt the song flowing out of me after I held my day-old daughter Erica in my arms for the first time. The feeling of fatherhood came rushing out and expressed itself musically as I sat at the piano and gave birth to the song. There was no editing or stopping. It was seamlessly written without much intellectualizing or even thinking. The song came alive complete and perfect. The same thing happened when I wrote “Handog Ng Pilipino Sa Mundo”. I remember coming home a few days after EDSA 1 and playing it on the piano without interruption, and completing this five minute song in an unbelievable two minutes. How was that possible, if the song takes five minutes to sing? The song runs for five minutes when played mechanically, but the creative bolt that hit me made me write the whole song instantly. It was the physical task of writing down the lyrics and melody that took about two minutes. It was again, a no-brainer. My best songs, I realize are the ones I that came into being effortlessly. It was like the songs wrote themselves. The creative process, when unimpeded, is an activity outside of the field of time. We engage in it in timeless mode. Why timeless? Because one loses track of time. Hours can seem like just a few minutes or seconds and vice-versa. When one is free of any impediments, blocks, anxieties and self-imposed limitations, or when one loses one’s guard, creativity can just sneak in and bring to life something beautiful. I suspect it is not so much that we lose our guard than that we act out what is natural to us, though repressed, and that is the act of creating. Children are natural artists, Pablo Picasso said, that is, until they lose their natural wonder and become jaded as adults. Lovers too, know what the flow and zone are all about. At the point of ecstasy, they lose themselves and it seems like the only thing that exists is their union. Gone is the ‘two-ness’. There is no ‘other’. There is only love. I think we Filipinos express this reality better with ‘Mahal Kita’ than when we say ‘I love you’. When we express love in English, it sounds like a negotiated settlement where an ‘I’ and a ‘You’ still exist. There are still two people present. But in Tagalog, subject and object are melded into a ‘kita’, a word that has eliminated ako and ikaw. Kita has no meaning in and of itself unless connected to words like ‘minamahal’ or even ‘kinasusuklaman’. The state of being in flow or zone mode may have something to do with ‘losing oneself’. I am talking of the self that is defined by the ego—that which always seeks its place in the world in terms of winning, being on top, having the most toys and whose daily activity is to prop itself up. It is constantly attacking and/or defending to make itself look good to itself and to other egos. Ego defines its happiness by how much it can do all of the above. But when we engage in activities where our main aim is just our unconditional enjoyment, we do so without ego. We come ‘as we are’ and so allow the joy of creativity to happen without the need to feed the ego entity, which never gets satisfied anyway. Much of Eastern spirituality blames the ego for all of the unhappiness we feel. I read one mystic’s musings that seems to define flow in spiritual terms. Speaking of his experience of communion with God, he says that (I paraphrase) God likes to visit when no one is home! Yes, there is no place for God, or the Muse or the Spirit that moves us to create great things when the ego is home, occupying all the space. Another aspect of the creative flow in full force is the tremendous power we feel running through us. It is an energy that seems to be tapped into the creative universe itself. It can make us feel God-like. How can we not feel this when the creative DNA we possess comes from the biggest Artist of all—the One who created everything? And so we feel like our Artist-Father, powerfully creative and wonderfully alive. It is an affirmation that we are sons and daughters of God and every creative act especially in flow or zone mode is proof of it. We honor God by feeling like God. The Hindus put it so well when they say that ‘no less than by a God shall a God be honored’. To me, flow, while it seems to happen intermittently and accidentally, is something that can be summoned if we constantly practice. And by practice, I mean Practice, Practice and more Practice. Constantly showing up for whatever it is we love to do and getting better at it, is the practice I am talking about. We practice to get ourselves ‘out of the way’ so that flow can happen. And when it does, songs and poetry, paintings, books, etc. are created by themselves. Great golf swings, three point shots, and other magical feats happen spontaneously. Greatness happens naturally—as effortlessly as the sun rises and sets. I know this may seem simplistic but it almost seems like we have two choices every time we create, and that is to do it ourselves and wrestle with the conditions set by our egos in the field of time, or ask a Greater Power to co-create with us and do things effortlessly in timeless mode. Author Ken Wilber, talking about spiritual practice says that constantly and conscientiously doing one’s rituals, whatever it is, makes one more ‘accident prone to enlightenment’. It goes without saying that apart from the practice of praying or sitting, there is also the practice of constantly catching ourselves and checking on how and when the ego takes over us. We have to make sure we send it off on vacation as often as we see it. After all, when the Muse shows up, the house should be empty. Or She goes away! While attending an artists’ conference on the environ-ment years ago at Robert Redford’s Sundance complex in Utah, I listened to a reading in translation by a Russian poet (I can’t recall his name now) who read a poem about “identity.” His poem started with a description of how he wakes up every day and puts on his clothes before leaving for work. He then noted how he “took off” his house as if it were a piece of clothing when he went out the door. He then “wore” his car and the streets he was driving on. On top of all that, he “wore” his ethnicity, his accent, his job, name, reputation, social status, citizenship and whatever else he thought he was. I was so moved by the imagery I haven’t forgotten it to this day. I’ve often thought of what we put on, or “wear” – how we are anchored to many identities that give us a sense of who we are. We have loyalties to institutions, organizations, traditions, etc. We are “members” of races, nationalities, societies, families, schools, sports clubs, churches, guilds, political and civic organizations, barkadas, cliques, and more. We are Noranians, Vilmanians, Kapamilya and Kapuso. We are also lumped together in geographic and statistical groupings that give us other identities. In short, we are tribesmen and tribeswomen in many ways and at many levels. We feel secure being part of different tribes. We are comfortable, for example, being Filipino, of Ilocano descent, male, married, of such-and-such a clan, a Catholic, an Atenean, a golfer, a Rotarian, a member of a business club, or Couples for Christ. We are defined by these tribal affiliations and, to keep our membership in good standing, we abide by their rules. Why do we do this and what do we get out of it? Because by being part of such groups, we get a shared experience of truths and conventions about the mysteries of life. The perks are many – from access to a great golf swing, to getting into a good school and making a lot of money, to acquiring a predefined moral code or access to even bigger privileges like how we “know” God. It is in man’s nature to want to connect and get a sense of belonging and stability, which comprise our comfort zone. Our membership nurtures us and affirms how we see ourselves and the world. We identify with the values and weltanschauung (world view) of every tribe we are part of. We adhere to the rules and respect the elders of the tribes and in turn we get affirmation that we are “good” people. The interconnecting values, relationships and rituals of all the tribes we belong to give us a sense of our place in the world. But there are times when the contract goes awry. We may wake up one morning feeling we have outgrown or find wanting some of the belief systems that we have been subscribing to all these years. We are no longer content with truth as interpreted by others. We want to learn things for ourselves. We want a greater experience than what the tribe can offer and see what’s behind the fence instead of just being told by the “authorities” what can be found there. We need to bypass the “middlemen” and have a more direct meeting with the great mysteries. In olden times, Socrates, Galileo, and even Jesus paid dearly for outgrowing their societies’ beliefs. But these days, people just drop out of the churches they belong to and opt to be “modern-day mystics without monasteries” as described by Carolyn Myss, the intuitive healer. They cease believing in the ethical or business models they once followed religiously. Everything is being questioned. There is a general feeling abroad that the old paradigms no longer work. According to Carolyn Myss, people who “unplug” themselves from the traditional paradigm of conventional medicine give permission to their bodies to heal in non-traditional ways and not to follow the conventional timeframe for healing. This explains why, despite their doctors’ dire predictions, some patients heal miraculously. They have allowed a new truth to take over their healing process. From where I stand, the world as I know it is not the same world I used to believe in 20 years ago. I have had to reassess many of the things I took for granted in matters of politics, morals, religion, and even what reality really is. In religion, I tend to focus more on the liberating and joyful idea of “original blessing,” a concept introduced by Mathew Fox (a theologian the present pope is not too crazy about) rather than on “original sin.” And I am equally at home with the idea of God as Consciousness, or Spirit, or even Emptiness where everything arises and recedes, as I am with a God possessing the familiar familial traits (Father, Mother, Son) I knew as a young boy. But two characteristics of God introduced to me as a child still ring true – that God is love and that God is everywhere. Much of my present spiritual practice is based on the belief that God is in everything and there is nothing that is not God. If we only open our eyes and look, it is impossible to miss God. And yes, God often likes to cross-dress as people who are unlovable, unattractive, even despicable and morally challenged. And that is why I try to love everyone, or at least see the Buddha nature or Christ in everyone. It’s not easy. That’s why I need to practice it. It is the smallest tribe that I belong to. Reprinted from my Sunday column on Philippine Star entitled HUMMING IN MY UNIVERSE. ‘There but for fortune go you or I’. I recall these words from a song I learned as a 13-year old (when I played guitar for a folk singing group I had with my siblings called ‘Meiling, Jim and Lory’) when I see people down on their luck, seemingly trapped in a hole with no apparent means of escape. I think of classmates, relatives, friends who have fallen into vicious intractable addictions, have gotten stuck in failed relationships or are slowly dying in toxic ones, those who have lost everything, or something equally horrible. I have great compassion and pity for them because I know that, there but fortune go I. I don’t see myself as different from them. I am not any better than they are, and when subjected to the same situation, I would probably fare about the same or maybe even worse. I could have gone off the deep end many times—but for fortune, I survived. I credit the many interventions that the Gods in their wisdom—and compassion—have sent to rescue me, pluck me out of a bad scene and redirect me to a better path. The following is a random list of just a few of the graces that have come to me at crucial moments in my 55 years of life. Some graces, I believe, were ‘angels’ disguised as people while others showed up as events or circumstances, devices even, that altered the direction I was heading. Some even came initially as bad news. I must say that while the gifts were totally undeserved at the time they were given, they were well used and much appreciated later on. I was six when my father died in a plane crash with the most loved President of the Republic, Ramon Magsaysay. I was the 9th of 10 children and our family was left without much financial resources to continue our schooling, much less pay for the new house my parents had just built. But the Jesuits, in gratitude to my late father who had served Catholic schools well, came to the rescue of the boys in the family (while the nuns took care of the girls) and I found myself, along with my brothers, on an Ateneo scholarship from my first day in kindergarten till the last day of my college life. I was not a great student; I didn’t excel in anything. But I imbibed enough knowledge, values and attitude to get somewhere. I sometimes wonder what my life would have been like if I had gone to a school we could actually afford. Who would I have become? We lost our big, spacious family home and I spent my school years in smaller rented apartments and houses. But even if we were lacking in financial resources, the family always had music in abundance. There was always music at home; my siblings and I were always singing, harmonizing. It made for great bonding, and it was good for our souls. School and the atmosphere at home instilled in me not only a love for music that has brought me to where I am, they also ingrained in me the desire to excel. The economic hardships the family went through were great for ‘building character’, as my Mom always said, and is probably responsible for whatever grit I possess today. A big deal for me—a major grace—was discovering the Beatles! To a kid of 11, sensitive, totally insecure and lost in that awkward, lonely stage of adolescence, stumbling upon the music of the Fab Four was like an answered prayer. John, Paul, George and Ringo were the epitome of cool. In my heart, I knew I was not cut out from the Elvis-loving world that ruled my early childhood. As a direct off-shoot of my discovery of the Beatles, I asked my older sister for a guitar on my birthday. Learning guitar and knowing the chords of ALL the Beatles’ songs was therapy to this confused inarticulate boy who was too shy and self-conscious to engage the grown-up world. With my guitar, I discovered a parallel language I could use that made sense to me. It was the language of feeling and emotion which gave me a sense of how to deal with some of life’s big topics that I was just starting to confront, such as love, career and idealism. Ironically, even if the Beatles era introduced many to the drug culture, I know that the Beatles’ music saved me from drugs, violence and other temptations that plague confused young people. I was too fascinated with music to go down that route. The Beatles set me on the path of music, not knowing that it would be the path I would be taking for the rest of my life. My generation was special. We felt that we were on the threshold not only of a musical wave but also of many historical changes. The zeitgeist, or the spirit of the times, was pointing to a new direction. And each time I heard a new Beatles song, I knew I was of one of ‘them’. I was a vanguard of the new world. The Beatles were rebellious and talented, and between what they could do and what the world allowed them to do, they commandeered our era, and that left a lasting impression on me. It gave me the boldness NOT to pursue a conventional job and be an artist. Meeting Boboy in high school and Danny in college pretty much put me on course and cemented the road that fate had laid out for me. While at the start, APO may have been just a vehicle for meeting girls through concerts, it was actually the beginning of a mission that we only became conscious of much later, the founding of something revolutionary in the Philippine music scene—what we know today as OPM. 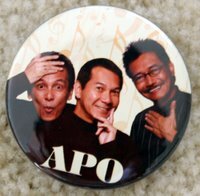 It is interesting to note that the APO’s career started with a farewell concert. I was all set to quit the group after college when I was accepted as an AISEC exchange student in Turkey. But alas, the promised free ticket never arrived and much to my regret then, I was ‘stuck’ with the APO ‘for the meantime’. It’s been 34 years since the grace of that aborted trip to Turkey. My accidental meeting of my wife Lydia Mabanta at a party while I was chaperoning a cousin at the weary age of 24 (at least that’s what it seemed like at the time to a young angst-ridden man) was a grace that pretty much set me on course family wise. It also gave me a needed anchor to ground me amidst the often unreal but rough and tumble world of showbiz. The arrest and detention of my mother and stepfather in 1981 for subversive activities against the Marcos regime released the political animal in me. New energies permeated not just my waking hours but also the very core of my being an artist. It liberated the reluctant rebel that was lurking throughout my college life in the early years of martial law. It coaxed out the angry young man who was now ready to express himself. I finally acknowledged that the basic task of an artist is to express what he feels to be true regardless of the disposition of the world. Being true to oneself was a primal task, and if it meant having to challenge the establishment in the process regardless of consequences, then so be it. Thus began years of writing and performing songs that defied the dictatorship. It was one of APO’s most prolific periods. When people ask me in the light of the way things have turned out for the country, if I regret my participation in EDSA 1, I tell them no. EDSA 1 was a moment when I felt fully alive. My actions then expressed the essence of who I was then. I was coming from truth and that fired me up. A last example of undeserved grace I have received came to me in my forties when I discovered zen. At that time, I was becoming disillusioned with many of the things I had earlier thought I believed in. I was successful, financially comfortable, famous, but none of that was cutting it for me and the prospect of more of it was giving me existential nausea. I was clearly unhappy, and I felt I had reached a plateau. I had outgrown many of my previously held assumptions and was ready to drop them. I had reached the end of the road where the map no longer worked. I was standing on the edge of a precipice and the unknown was staring at me, mocking me to take a leap. Saying yes to an invitation to attend an introduction to zen changed my course. From the noisy, transient and ego-centered world of showbiz, I entered a territory which required me to drop my ego and meet the quieter, yet eternal aspects of who I was. It pointed me to truths that seemed contrary to how the world as I knew it was being run, or the way everyone wanted things to be. It showed me life without any spin, without projections of any kind ‘neither quieting the noise nor embracing the silence’. I was so flabbergasted to see truth so self-evident I wondered how I could have missed it. It opened my own life to me just as it is, so effortlessly beautiful and deeply rich. I realized I was on a spiritual journey. It’s been nine years since I started meditating, and all those countless hours of sitting and ruminating on life have chilled some of the passion I used to have for certain things and ignited newly discovered ones. Once again, the universe seemed to have taken a more deliberate hand at what I should be doing with my life. The internal world continues to unravel, showing me new possibilities of what I can be. I have since written four books, held countless workshops on personal growth and taught in college for a few years. I have also changed residence for the meantime and moved to Sydney. Looking back, I could have ignored many of these ‘interventions’ when they presented themselves. What if I had not asked my sister for a guitar when I was 11? What if I had not met Danny and Boboy and Lydia? What if I did but walked out and lost patience with them during an argument as I did many times when I was younger? What if fate had taken me to Turkey? What if my Dad didn’t die on that plane? What if my parents were never incarcerated? And what if I never attended the zen orientation I was invited to? How would my life had turned out if events had turned out differently and had not made the choices I did? My life could have been just another story of wreckages. Or maybe not. No one really knows. But I don’t really believe I made the choices. In hindsight, I now know I was not aware, or awake enough to make them. I was not totally present to have fully understood every decision I made then, or to even imagine their consequences. But for fortune, I didn’t do too badly. Or maybe I am giving myself too much credit. Perhaps it is more accurate to say that life, or the Gods, did well by me. Maybe.